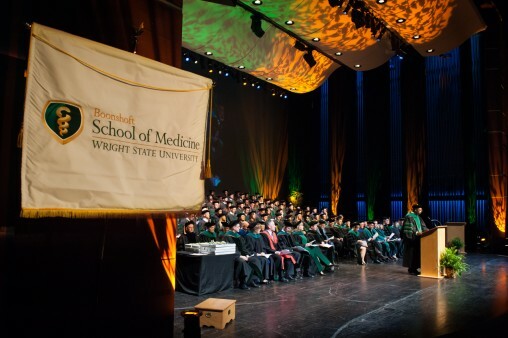 The Wright State University Boonshoft School of Medicine will hold its annual graduation ceremony on Friday, May 27, at 6:30 p.m., at the Benjamin and Marian Schuster Performing Arts Center in downtown Dayton. The graduating class includes 100 medical students. The event can be viewed through live streaming at wright.edu/streaming. Coverage of live events begins about 15 minutes prior to the event start time. Each student’s journey through medical school is unique. Here are just a few of their stories. Nicole Craker was hooked on surgery after witnessing a surgeon perform surgery flawlessly under pressure. She will take the next step on her medical journey at the University of Kentucky Medical Center in Lexington, Kentucky, where she will purse a residency in otolaryngology. Diagnosed with cystic fibrosis at the age of 8, William Elder Jr. was not expected to live long. Now at 28, he is alive and thriving, thanks to Kalydeco, the first oral drug that treats the underlying cause of cystic fibrosis in 4 percent of the people with the genetic disorder. He is embracing life and is looking forward to beginning his residency in family medicine this summer at the Sutter Medical Center of Santa Rosa in Santa Rosa, California. Saagar Sanghvi’s first exposure to medicine was through his father, who is an obstetrician and gynecologist. Throughout medical school, Sanghvi devoted much of his studies to research. Interested in cardiology, Sanghvi will begin a residency in internal medicine with plans to pursue a fellowship in cardiology. Eric Thuney will continue to lead and serve in the Dayton community as he begins his next step on his medical journey. 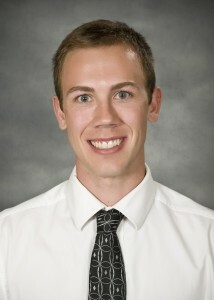 He will begin a residency in family medicine at the Boonshoft School of Medicine this summer. A recipient of the Primary Care Medical Student Choose Ohio First Scholarship, he has committed to spending at least three years in Ohio. A native of Ohio, he plans to remain in the state after his residency. More details about each of these graduating medical students are included in the stories below. Nicole Craker knew she wanted to become a surgeon after observing a surgeon during her surgical clinical rotation. She was mesmerized by the way the surgeon performed the surgery, even under the pressure of unexpected complications, including an elusive bleeding vessel. The surgeon proceeded with a calm confidence drawn from years of practice and sacrifice. Fascinated, Craker began shadowing various surgical fields and eventually met an otolaryngologist, an ear, nose and throat specialist, who invited her to shadow her in the operating room. Craker witnessed a breadth of care that intrigued her, from a child with chronic tonsillitis to an elderly gentleman undergoing extensive cancer resection to remove tumors. 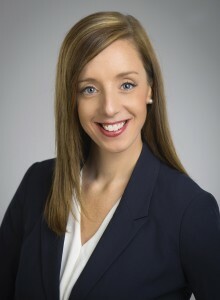 After graduating from medical school, Craker will begin a five-year residency in otolaryngology at the University of Kentucky Medical Center in Lexington, Kentucky. She is interested in pursuing a fellowship after residency. Her respect for and indebtedness to faculty and staff mentors has led her to desire a career in academic surgery, where she can teach medical students and residents as a faculty member at an academic medical institution. Academically, Craker is a student leader among her classmates. She was one of 19 medical students nationwide to receive the 2015 American Medical Association (AMA) Foundation Physicians of Tomorrow Award. She was inducted into the Gold Humanism Honor Society and has received numerous academic awards and recognitions, including being elected to the Alpha Omega Alpha Honor Society. She was involved in Phi Rho Sigma, a national social and community service organization, where she helped with canned food drives, a clothing drive and a pancake breakfast that benefited local organizations. When William Elder Jr. was a third-year medical student in January 2015, he was invited to attend the State of the Union Address as a guest of First Lady Michelle Obama. During the address, President Barack Obama announced that he was launching the Precision Medicine Initiative, an emerging approach to promoting health and treating disease that takes into account individual differences in people’s genes, environments and lifestyles. Less than two weeks later, Elder was back in Washington, D.C., where he attended a press conference about precision medicine. President Obama referred to him as an inspiration and an example of how precision medicine can help deliver the right treatment to the right patient at the right time. Diagnosed with cystic fibrosis at the age of 8, Elder’s life expectancy was low. Now, at 28, he is alive and thriving, thanks to Kalydeco, the first oral drug that treats the underlying cause of cystic fibrosis in 4 percent of the people with the genetic disorder. When Elder first took the drug in February 2012, he was finally able to breathe out of his nose. Over the next few days, his sense of smell improved, along with his sleeping habits and lung function. He had more energy and began to believe that he would live long enough to be a grandfather. In 2013, Elder spoke about his experience at a congressional briefing hosted by Friends of Cancer Research to educate members of the U.S. Senate about new processes developed by the FDA to speed the approval of breakthrough therapies, including Kalydeco. “I wouldn’t have been able to get through my first year of medical school at Wright State University without Kalydeco,” the Stanford University graduate told the senators. At the Boonshoft School of Medicine, Elder has wasted no time at all. He has been involved in the Ohio Academy of Family Physicians, American Academy of Family Physicians, Bioethics Network of Ohio, Family Medicine Interest Group and the American Medical Association. Passionate about family medicine, Elder will begin a residency in family medicine this summer at the Sutter Medical Center of Santa Rosa in Santa Rosa, California. Saagar Sanghvi first became interested in medicine at an early age as he watched his father, Kamlesh Sanghvi, M.D., an obstetrician and gynecologist in north Dayton, respond to patient calls and rush off to the hospital. 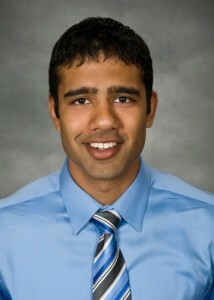 During his undergraduate studies at the University of Michigan, Sanghvi became interested in cardiology when he had the opportunity to work on a research study under a cardiologist. Intrigued by the biological sciences and cardiology, Sanghvi earned a master’s degree in anatomy at Wright State University, where he studied stroke treatments in the Department of Neuroscience, Cell Biology and Physiology and became interested in pursuing research as part of his career path. Throughout medical school, Sanghvi has devoted much of his studies to research. He has presented at poster presentations and co-authored a publication and case reports. Interested in learning more about cardiology, he approached Mukul Chandra, M.D., a clinical associate professor at the Boonshoft School of Medicine. Chandra gave him the opportunity to complete a case report about a 54-year-old male who had a heart attack. He worked with Chandra and internal medicine residents Teresa Ratajczak, M.D., and Samuel Roberto, M.D., on the case report. He presented the report, “True Posterior Myocardial Infarction,” at a poster presentation of the Society of General Internal Medicine 2016 Annual Meeting in Florida in May. When Eric Thuney applied for the Primary Care Medical Student Choose Ohio First Scholarship two years ago, he didn’t mind that he would have to commit to a residency in primary care in Ohio for at least three years. He grew up in Centerville and is a graduate of Archbishop Alter High School in Kettering. In addition, his entire family is from the Dayton area. So, it was a no-brainer for him. He knew he wanted to remain in the Dayton area, serving as a family physician to a community that had nurtured and supported him. 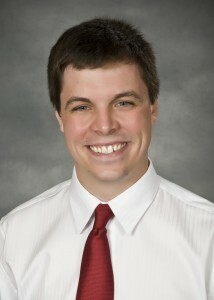 Thuney will begin his residency this summer in family medicine at the Boonshoft School of Medicine. He would like to remain in Ohio after his residency, hopefully in the Dayton area so he can continue to be involved with the Boonshoft School of Medicine. He would like to be a community preceptor, a practicing physician who provides personal training, supervision and instruction to medical students. Ever the ambassador, Thuney continued to promote Dayton to prospective medical students who arrived at the medical school for interviews. He also worked with undergraduate students from Wright State and Ohio State University, giving them advice on how to navigate the medical school interview process. He also reviewed their medical school applications, providing them with feedback and advice.